Contemporary vs Classical Piano Lessons: Which is Better? Many students who study piano should have at least a vague idea of the style of music they would like to play. A student who loves the music of Beethoven and Chopin will prefer classical piano lessons taught in the traditional style. Those who love the synth genius of Jean-Paul Jarre or the syncopated madness of Chick Corea will want lessons in a more contemporary style. Each of these types of lessons has its own place and its own challenges, and many students will find that one comes more naturally to them than another. Classical piano lessons emphasise excellent sheet music reading skills along with extensive scale and arpeggio studies for impeccable speed and agility. The level of complexity an accomplished classical pianist can read and perform at is beyond any comparison. However, one disadvantage of exclusively traditional piano lessons is pronounced difficulty with playing by ear, creating accompaniments, and improvising on-the-fly. We’ve seen plenty of accomplished classical pianists be able to play Fantaisie-Impromptu perfectly but struggle to play “Happy Birthday” with chords and improvisation by ear. No joke. If classical piano is something you’d like to explore, we recommend studying with Colin Frotten for musical theatre or Constantine Caravassilis for classical composition. You can even take a trial lesson with each of them to see who clicks the best with you. Students learning popular music still learn to read sheet music as a foundation but as they advance they tend to focus on how to play by ear, compose, arrange, and improvise. Students will also learn to read chord symbols and use chord progressions fluently so they can read simplified jazz and rock charts. These abilities are essential for playing in jazz and rock bands. The downside to this is that we see too many piano students who rely on their ear and chord charts tend to be very slow music reader unless care is taken to include some music reading in lessons. If you’re lucky enough to live in Toronto, we’ve got some incredible contemporary piano teachers we invite you to take a trial lesson with. For synth and sound creation or advanced jazz studies, check out Nick Maclean. For pop (especially neo-80s) check out Dana Jean Phoenix‘s videos – you’ll be amazed! From the first lesson, the piano teacher needs to ask what kind of music the student would like to play. Likewise, the piano student should ask the teacher what they specialise in. Is it a good match? If not, move on! Not consider this: as much as a student may want to only study classical or contemporary music, elements of the other style need to be taught in each lesson.The best piano teacher for most students’ needs will have experience in both modalities. A well-rounded classical pianist should be able to play a little by ear and create basic chordal accompaniments. A proficient jazz pianist needs to read music fluently for those times when charts are written in standard music notation. 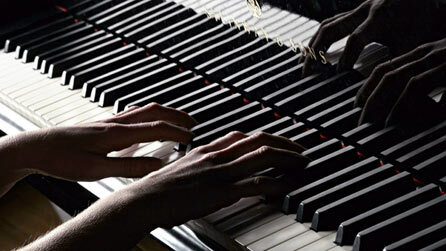 Classical piano technique will also enable a jazz pianist to play improvisations with skill and finesse.